Renovating your kitchen, and left without a place to make basic meals? Living in a tiny urban apartment that just doesn’t have room for a standard setup? One of these 13 high-tech, modular, movable and compact kitchens might just be exactly what you need. Ideal for creating kitchens where there were none – in offices, warehouses and converted living spaces – compact kitchen units pack a lot of function into the smallest possible space. No space for a full-sized kitchen? 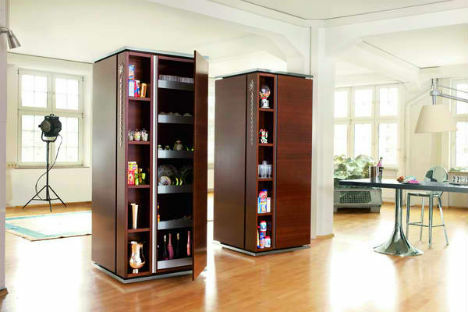 Two foldable options from Italian firm Florida Furniture open and close either vertically or horizontally. 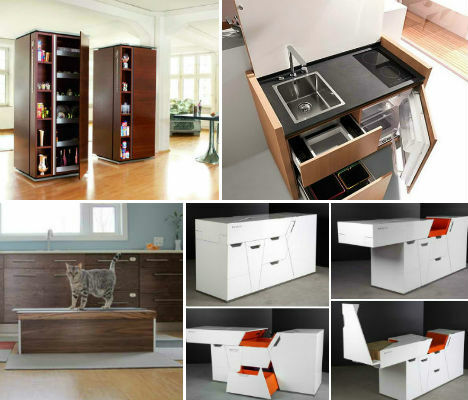 Moove 01 features lots of storage space, with two large cabinets sliding apart to reveal a sink, stove and countertop. 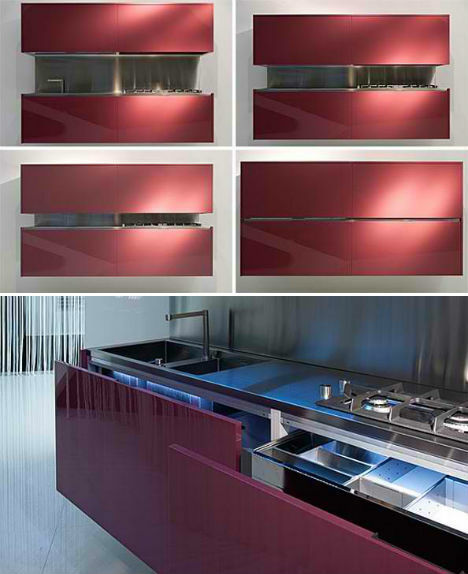 Moove 02 hides basic, compact kitchen functions in a sleek volume that looks like standard cabinetry when not in use. 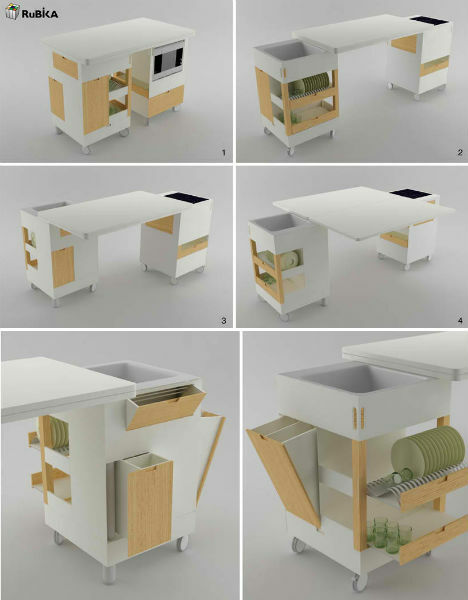 The designers at Stadtnomaden broke down the conventional kitchen structure into individual ‘task modules’ to develop their unique ‘A la Carte System’. Choose the functions you need – including a sink, an oven and storage space – and fit them together any way you like. The units connect with magnets, so they can be placed back-to-back in the center of a room, or side-to-side. UK-based designers Splinter Works turn a super-simple kitchen into a conversation piece with the globe-shaped ‘Dime Kitchen’. This little workstation could be used for all kinds of different things, from tea and coffee to a wall-mountain laptop station. The 10 overlapping blades of rosewood that close over the kitchen when not in use were inspired by the gleaming edge of a spinning coin. 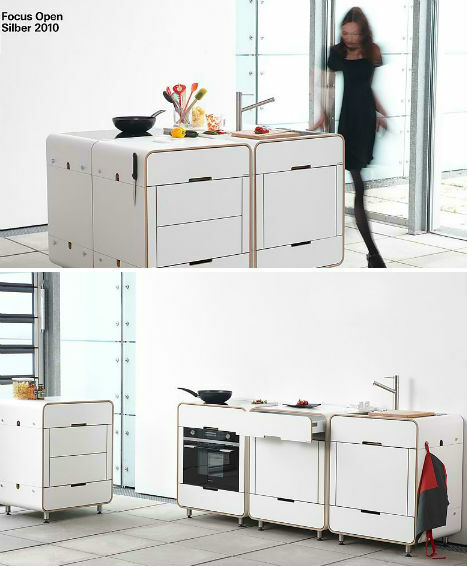 Looking as much like a puzzle as it does a functional piece of furniture, the Boxetti kitchen is a compact unit that opens in all sorts of unexpected ways. This kitchen island flips and slides to reveal a sink, mini fridge, shelves, an expandable countertop and even built-in, pop-out bar seats. A power supply, two burners and various unidentifiable gadgets are contained within this black-and-white column kitchen by Rome-based designer Adriano Conti. The Mini Kitchen has high-tech looking dispensers for plates and glasses, a built-in oven and storage space in a footprint that’s not much larger than a trash can. 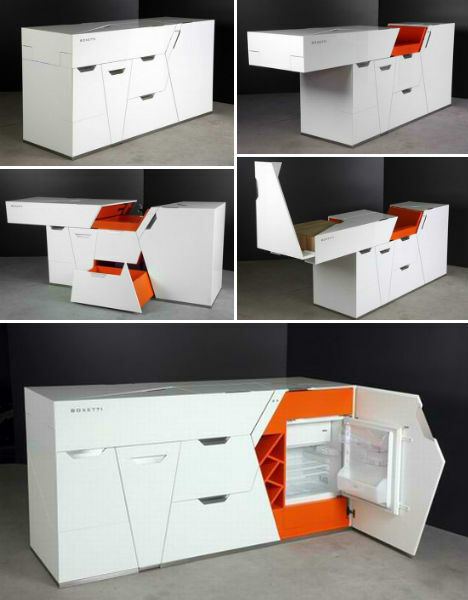 Designer Petr Kubik rethinks the rectilinear refrigerator with ‘Future Dining Table’, an appliance that looks like a modern seating area at first glance but actually conceals a fridge. 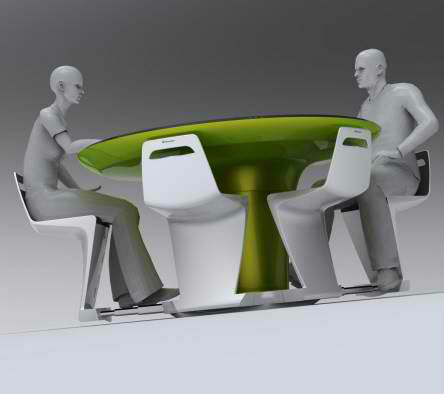 The translucent tabletop enables you to see the food that’s stored inside, and the unit also has storage space for small electrical appliances. 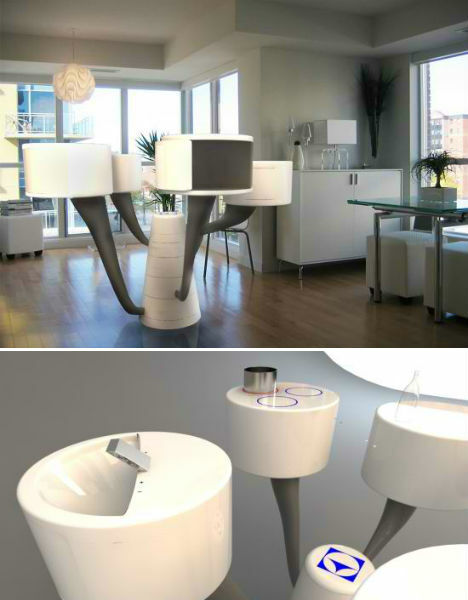 The shape of Balin Lee’s ‘Kitchen Tree’ might be taken from nature, but this appliance seems more fitting for the moon. 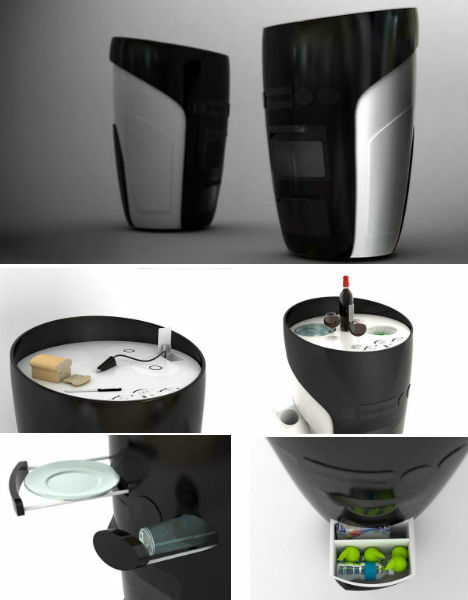 The Australian designer created this totally-out-of-the-box kitchen for the Electrolux Design Lab Competition with the theme “a household item for the next 90 years.” The central cone is a refrigeration unit, while each ‘pod’, on its own freely rotating arm, offers a different function – sink, stove, storage and a freezer. It may be small, but Kitchoo’s Cuisine K1 packs a punch in the form of an integrated fridge-freezer, 2-burner cooktop, induction oven, telescopic mixer and a sink. 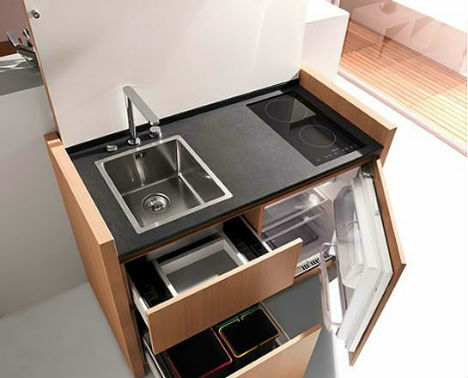 You can even get an integrated dishwasher and/or trash compartment as optional add-ons. When closed it’s as simple as can be, all pale wood finishes with no visible hardware. 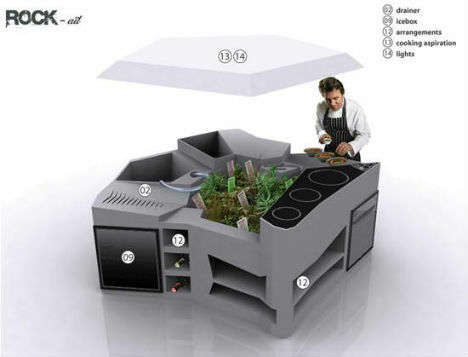 A group of four designers incorporate a small personal kitchen garden into a cool nature-inspired polygonal kitchen called the ROCK-aïl. Set under a white canopy that provides both lighting and an exhaust hood, this mini kitchen incorporates all the basics that you need, even space for wine storage and a little built-in hose to water the plants. 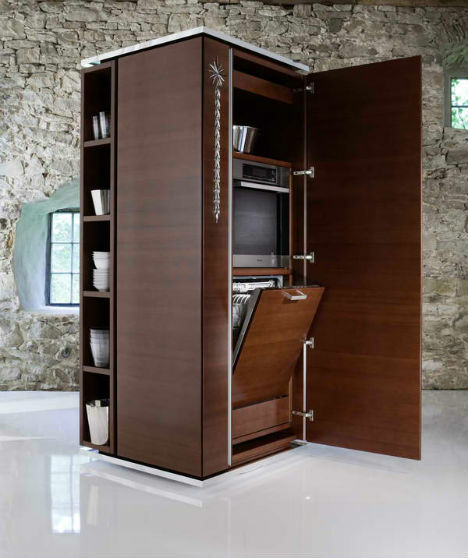 Rotate and unfold the RuBiKA kitchen by Lodovico Bernardi any way you wish to adapt to your space and needs. 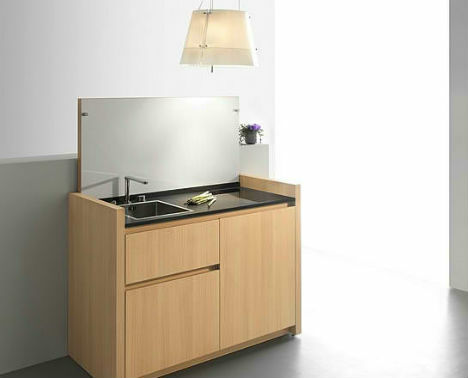 Made of FCS-certified wood, this compact kitchen unit has two support elements that slide out from the tabletop, one on legs and the other on casters. 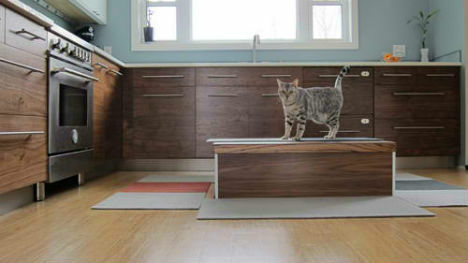 It features pull-out counters, a cooktop, an oven, a sink, trash compartments and dish storage. 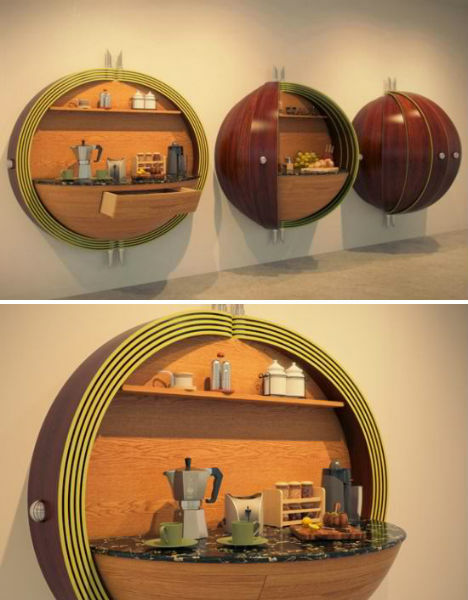 Measuring just 1.8 square meters (just under 5 feet in diameter,) the Circle Kitchen from Compact Concepts is made to be placed in the center of a room. The column-shaped design fits nearly all of an average home cook’s needs into this tiny space including a microwave, dishwasher, sink, cabinets and counter space. 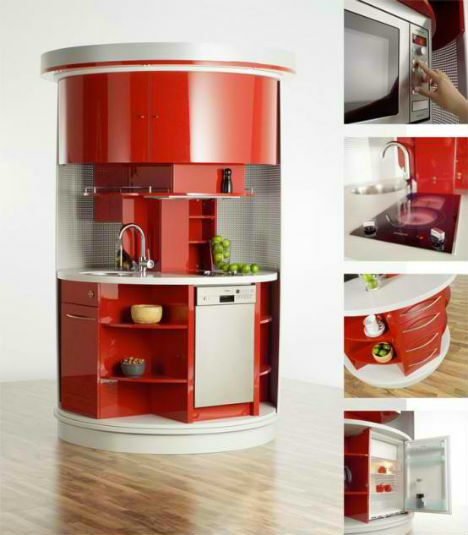 Available in a range of finishes with all kinds of customizable gadgets, this mini kitchen for small spaces starts at $6,500. With two units that each take up no more than a single square meter of floor space, the Tower Kitchen by French designer Philippe Starcke separates hot and cold functions for optimal energy efficiency. The ‘hot tower’ holds the oven, while the ‘cold tower’ houses the fridge and freezer. The only thing that these twin kitchen towers are lacking is a sink and counter space, but you can get both from an optional add-on island that also functions as a dining table. A kitchen island can offer a lot of function, but many people just don’t have the floor space. What if you could just stow it in the floor, and have it pop up exactly when you need it? That’s exactly what the motorized kitchen island custom-built by Tim Thaler does. Thaler actually programmed this hidden island to move up and down with an app created for his iPhone.